When you are maintaining a garden in Fort Worth, you know that the unpredictable and severe weather can make it a challenge. Blooms Landcare is a master of managing Fort Worth plants. We are happy to share with our clients the best tips and tricks to make your landscaping lush and green year-round! Here are a few of our best management practice tips! There are certain times of the year when plants thrive. If you are thinking of adding a small garden to your yard, take a look at the National Gardening Association’s planting calendar for Forth Worth. They take into account the weather and create a strategy for optimal growing potential. They even have a printable planning guide for each season that is incredibly useful for novices. If you would like a great place to start learning about planting, this is a fantastic resource. While this may seem really straightforward, hydration and sunlight of Fort Worth plants can be rather complex. Depending on the design in your yard, one plant may be close to a sprinkler when it needs to be a bit further away. Perhaps one tree is providing too much shade to a full-sun plant. These are the intricacies that our landscape designers think about when assessing a Fort Worth yard. Whether you are trying to remodel your landscaping or trying to maintain one, it is a big job. We recommend consulting with a professional like Blooms Landcare and calling in for some assistance. 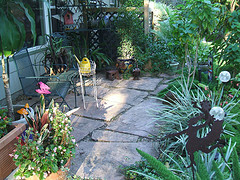 Our experienced and talented designers have helped countless Fort Worth families and businesses with their landscaping. If you have questions about managing your Fort Worth landscape, contact the experts at Blooms Landcare. Call (817) 688-5352 to schedule an appointment with out team of experts.